Let’s talk art, the fine Danish art known as hygge. You may have seen this word before but you are probably not sure how to pronounce this unusual word. Hygge pronounced as ‘hoo-ga’ or ‘hue-gah’ is the Danish concept of feeling content and cosy by enjoying even the simplest things in life. Having a nice hot cocoa with marshmallows or enjoying reading a good book on a rainy day is just two of the ways you have probably experienced hygge without even realising you have. In Danish tradition, hygge is such an important and defining feature of their culture. It is like the DNA mark of all Danes! Due to the Danish obsession of all things cosy, Denmark has always been rated the top of the list for the world’s happiest countries. But what truly defines hygge? Now we know what hygge is and how to pronounce it, what truly defines hygge? Firstly, hygge is all about comfort. The warm crackling fire, the snowy outdoors, the cosy sweaters and the hot wine can make it all comforting and all the more hygge. Next is the company, hygge wouldn’t be hygge without a group of your close friends to share it with. 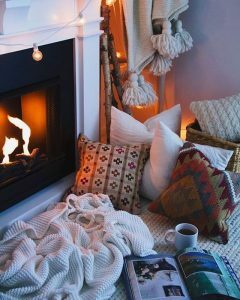 You can do hygge by yourself, all curled up on the couch with a blanket and a cup of tea but it’s just not the same without experiencing it with others too. Connecting with nature is also another definitive trait of hygge. Although you can and many do practice hygge indoors, truly living hygge involves enjoying the wonderful outdoors; the sounds, smells, sights of nature. The natural wildlife roaming the woodlands, cooking outdoors with fresh natural ingredients are all part of the hygge life. Even hanging your clothes out to dry on the line is a form of hygge. There are two more actions that define hygge and they are easier said than done, one is relaxing and the other is simplicity. No relaxation isn’t the same as just sitting still. Relaxing is doing something without being in a rush. Want to take a walk? Don’t do a brisk walk rather a leisurely slow walk is much hygge. Want to exercise? By all means! But don’t exercise in a hurry or hastily rather take your time with your exercise and fully enjoy it. Finally simplicity, hygge isn’t about chasing the thrills in life, rather it’s enjoying the simple things in life. Sipping on your coffee in your dressing gown while looking out the window is ultimate hygge goals. Take a walk: Danes love to go for a long walk no matter the weather. Walking is very hygge and is such a relaxing and easy way to show your hyggeness. Have you had a chance to stroll the beautiful areas of Hereford? 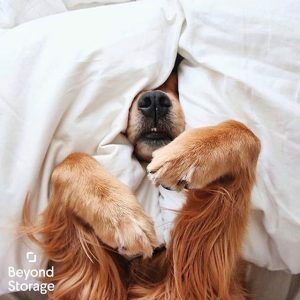 Why not make that your next trip this weekend and even pop in and have a coffee with us at Beyond. Enjoy a hot drink: Cup of tea, creamy coffee or even a nice hot cocoa with whipped cream and marshmallows is beyond hygge. On a cold and wet day, a hot drink can lift up your mood and add the extra hygge in your step. Sing songs: Unleash your inner talent and sing away to your favourite songs. Whip out the old school classics and have a sing-along in your home. Invite your friends over too and hygge it up! Snuggle up! : There is no cosier activity other than just cuddling! Get out the blankets, the plump cushions and the oversized jumpers and snuggle up on your sofa, bed, with your kids or your pet. Now let us help you take hygge to the next level.